Last week, a particularly fun project at work took me to Dallas, TX for the annual Heli-Expo Show, which is a ginormous helicopter trade show attended by a very international jet-setty crowd. The product launch in which I participated was fun, but the people watching was beyond. I won’t recommend the hotel we stayed in in downtown Dallas to you, the Hyatt Regency. It was aging, noisy, not particularly business traveler-friendly and not particularly luxurious. I’ve stayed in nicer Courtyards and Hampton Inns, to be frank. On the other hand the Omni Hotel, which is attached to the convention center and therefore exceedingly convenient for business travelers, was lovely. We attended several events there and all of the public spaces were modern and luxe. I can recommend a terrific restaurant for downtown Dallas dining, however. Stephan Pyles is a renowned chef in the Dallas area, one who usually focuses his restaurants on tex mex flavors. At his namesake eatery, he’s experimenting with South American cuisine mixed in with Mediterranean and Middle Eastern flavors in a gorgeous setting with a sweeping view of the open kitchen. The result of this curious amalgamation is an eclectic menu reflecting exciting cuisine and a nice break-up of the usual Dallas culinary landscape of BBQ and tacos. Just as fun as the atmosphere, I was lucky enough to have dinner with a quartet of colleagues who were a total blast: BAE gents T, M and D, and a really fun dude from Sweden, H. I will keep their anonymity, but tell you that H’s tales of hunting polar bears and the real story of Stieg Larsson’s lover were almost as good as the ceviche, which is how we began our meal. 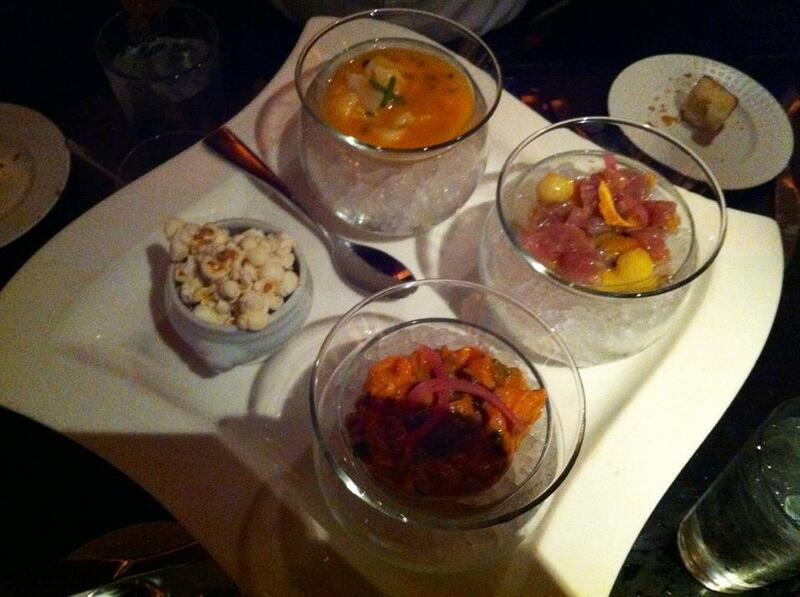 Our ceviche trio, accompanied by a small bowl of palate-cleansing popcorn, was major league baller. We chose the tuna, scallop and salmon varieties, and though I didn’t expect to like the salmon at all, I actually adored all three, with the scallop, golden tomato and aji mirasol combo being my favorite. It was clean, pungently spicy, and exquisitely fresh – a briny, bright pop of flavor with perfectly soft, uncooked scallops. The tuna with jicama and grilled orange was silky and sweet as only raw tuna can be, while the salmon Veracruz-style was more earthy, with capers, green olives and jalapenos. The ceviche tasting is a signature experience at Stephan Pyles, and not to be missed. Even if you don’t groove on sushi, take a gamble and at least try a taste of one of these offerings – the citrus component of the sauce changes the texture of the seafood, giving it a “cooked” quality without any actual heat applied. This is food best sampled on a beach, with the sun beating down, no shoes on, and a man named Francisco catering to your every whim – but this Dallas hot spot is pretty close to the mark, and the inventive flavor combinations can’t be beat. I can’t tell you how badly I wanted to order every item off the appetizer menu and skip the entrees. I mean, come on! Foie gras parfait? Tamale tart with peekytoe crab? Deconstructed scallop chowder? That is a wonderland of food, just as Sweden, apparently, is a wonderland of hunting endangered animals for dinner. However, in the interest of NOT appearing completely gluttonous in front of co-workers, I elected to order the pork chop with apple-onion cajeta and root vegetable crudo. Now, only being a hobbyist gourmet and not, like, formally educated, I assumed a crudo was a raw sauce, and I had no idea what a cajeta was. Now that I wiki it, I think the sauce on the chop may have been the cajeta, and maybe the side dish, which I quite liked and which our charming waiter told me was like a posole mac and cheese, was the crudo? Whatever it was, it was tasty. And the chop? Oh, the chop was exceptional. They actually gave me a choice on how I wanted my pork cooked! Medium, baby! 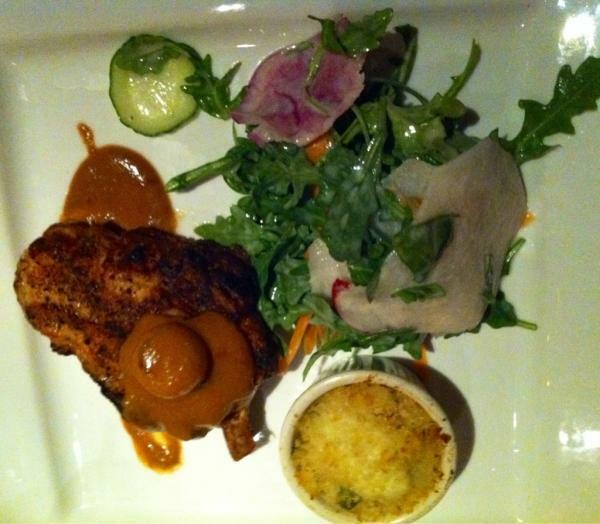 The thick, smoky chop was just pink in the center, exceedingly tender, divine. The light arugula salad on the side was sweet but still earthy, with shaved root vegetables ohwaitmaybethatwasthecrudo? God, so confusing – I guess this means the apple and onion cajeta was the sweet, paprika-y sauce on top, the salad was the crudo, and the cheesy posole was a bonus dish of love? In any event, it was all fantastic. This Pyles dude knows what he’s doing. And this is how I get led down the primrose path to dessert – when everything leading up to it is that good, I can’t help myself. But before we get there, I have to tell you about the cowboy ribeye, which I did not taste, but had to be amazing. This gigantic Fred Flintstone-looking slab of meat was piled high with crispy red-chile onion strings and dressed with a wild-mushroom ragout. If I knew D, who ordered it, a little better, I would have been all over asking for a bite, or six. He could have spared them – the plate was big enough to keep dearly-departed Andre the Giant busy for a few hours. Make sure someone at your table orders this when you visit Stephan Pyles, and don’t be as polite as I was about asking to try it. OK, about that dessert. Holy expletive deleted, you guys. I wish I hadn’t been so full of so-called crudo, because it was stratospherically awesome. It’s not on the online menu, but I got the pumpkin panna cotta with salted caramel sauce, churros and homemade marshmallows (!!!!!). I want it again, right now. I want it every day for the rest of my life. Now, the panna cotta itself didn’t hold a candle to the same dish I had as an appetizer at the CIA last December. But the marshmallows and explosively good salted caramel sauce rendered everything else on the plate ancillary. 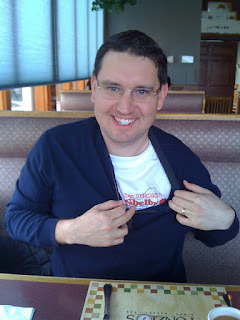 The sauce was dynamite – thick, rich, sweet caramel spiked with crispy, crunchy sea salt. Never underestimate the power of the salty/sweet combo – I think it should be used at peace talks to calm people down. The pillowy-soft marshmallows were bruleed just a hint and giving off that edgy, burnt sugar taste that’s so satisfying, and they played with the fried, fluffy churros in a most pleasing way. This was, simply, sublime. With the quality of food being put out at Stephan Pyles, I’m not surprised at all I had a bit of a time getting our reservation on short notice. If you’re in Dallas, and looking for an impressive place, modern cuisine and ambiance, this is the place for you. I give it a nine on the BHS scale, and I think my compadres were similarly impressed. We may not have experienced any polar bear or caribou, but between the yummy ceviche, huge entrees, and astonishing dessert, I didn’t need anything more adventurous. Bravo, Stephan! PS. This is Tommy, husband of Big Hungry Jill. He is awesome for many reasons, not the least of which is the time he bought me a muffin to nosh on during my morning drive home from their house in NJ, most definitely saving me from falling asleep at the wheel and meeting my demise in a fiery car crash. You can see he is sporting a really rad shirt. You too can be the proud owner of a shirt like this, and represent Big Hungry Nation. Because I’m redoing the artwork for BHS right now and getting some new graphic design stuff together, I’m calling a fire sale on my existing stock of shirts. If you would like one, for only $20, leave a little contact info in the comments below, or contact me on the Facebook. These are the perfect shirts in which to act like a gluttonous little piggy, so make sure to get yours today. Oh, and by the way, you and I both know I am not meant to die in a fiery car crash. I will totally get taken down at the age of 109 by a too-rare pork chop or a pack of wild boars or something. One of these days, the pigs are bound to fight back.